For the longest time I’ve been wanting to try my hand at curing meat and making sausages. I’ve been following a couple of charcuterie bloggers and have been fascinated by what they’re turning out. Since I spend less time in the kitchen during the summer I figured now would be a good time to cross the cooking Rubicon and start. Gotta begin somewhere and so I thought I’d start with something which seems fairly straightforward and simple: bacon. So how do you start making bacon? Two important items are needed. Some pork belly and some curing salts. Here’s where living in Chicago makes a world of difference. We’re not “hog butcher for the world” for nothing. As I’ve written before, there are lots of butcher shops here, off the top of my head I can think of 5 within short driving (or bicycling) distance from our home in Wrigleyville, so getting the pork belly was pretty easy. Just call around to find out who has some. In this instance I ended up going with my stand-by butcher shop for specialty items, Gepperth’s Market, in Lincoln Park. Whenever I’ve needed something out of the ordinary (like a suckling pig) they’ve been able to fill the order pretty easily, if they don’t have it on hand. Sure enough, they had some fresh pork belly so I drove down and picked some up. Next stop, curing salt. Where to get it? I asked another Chicago blogger (From Belly to Bacon, seriously check him out) where he sourced his stuff from and he replied Spice House on Wells has it. This was perfect since it’s basically right around the corner from Gepperth’s. Two quick stops and we were off to making bacon! 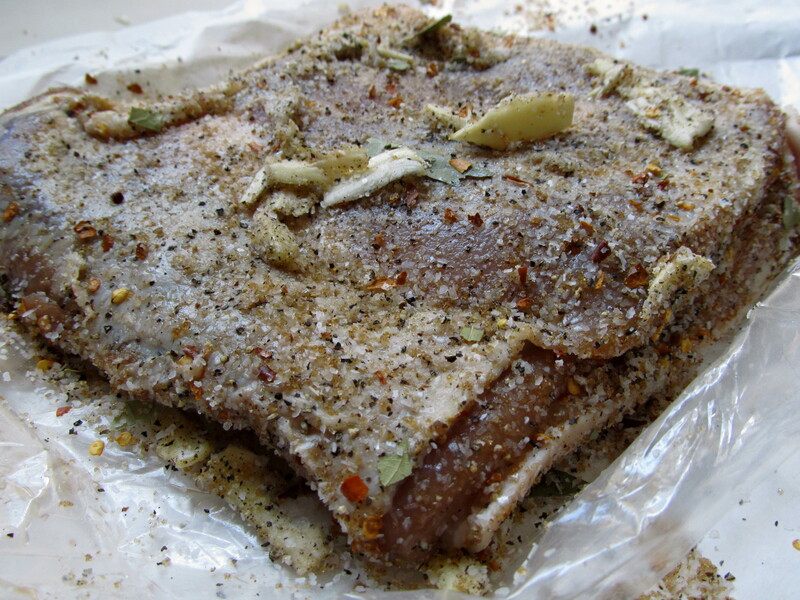 So, for less than $10 I had 2.5 lbs of pork belly and enough curing salt to make many pounds of bacon. For the cure, I used Ruhlman’s basic savory cure from his new book Twenty. Just trying to keep it simple. Right now we’re 3 days into the cure so check back at the end of the week to see how my bacon turned out! Combine and mix all ingredients. Rub onto both sides of pork belly. Place in plastic bag, seal and set in refrigerator for 7 days. Occasionally flip the pork belly over. Next Post Part 2 of the Making Bacon Experiment – Success! Wow! You are a brave man. I’m excited to hear how this turns out. ‘Brave’ was the first word in my head having seen part 2 first …. actually I lie. My first thought was why can’t I find bacon like that here in Italy!?! Now I know how to make my own. Any clue as to where I can find Wells for the salt? Thanks! It’s very very easy! Much easier than I thought it would be. The curing salt (pink salt, Prague powder, sodium nitrite) can be found on Amazon (what can’t be found there?) or I’d find a local spice store. If that fails, ask your butcher where he gets his! Reblogged this on Living Italiano.